In “Battle of the Titans” -- the final episode of Return to the Planet of the Apes (1975) -- a desperate General Urko attempts to regain power in Ape City, while the astronauts and Zira and Cornelius take the opportunity to bring peace to the planet of the apes. In particular, Cornelius and Bill return to the icy mountain where they stashed the book “A Day at the Zoo,” which revealed intelligent 20th century humans and primitive apes in zoos. After recovering the text, the astronauts and the pacifist chimps prepare to present the book to the Ape Senate…and to change a planet in the process. Although Return to the Planet of the Apes sometimes succumbs to childish story-telling instincts (and does so again in this final episode…), I nonetheless have great appreciation for the animated series because the characters and situations don’t remain locked in stasis. The episodes aren’t interchangeable, and character and story arcs are, actually, present. To wit, the humanoids rescue their companion, Judy, from the Underdwellers during the course of the series. They also find the other human astronaut, Brent. They acquire a weapon with which to defend the primitive humanoids in the form of a World War II fighter plane. 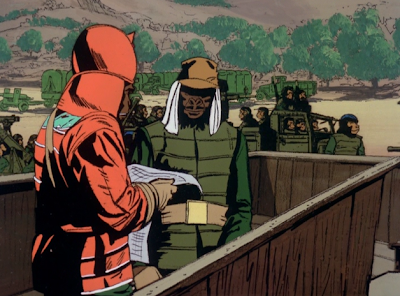 Additionally, Urko attempts to seize power from Zaius, and then ultimately loses it. That’s a huge shift from the beginning of the series (and the other installments in the movie and TV franchise), and away from Dr. Zaius’s admonition to Zira and Cornelius that even the mere idea of intelligent human beings is enough to warrant the genocide of the humanoids. 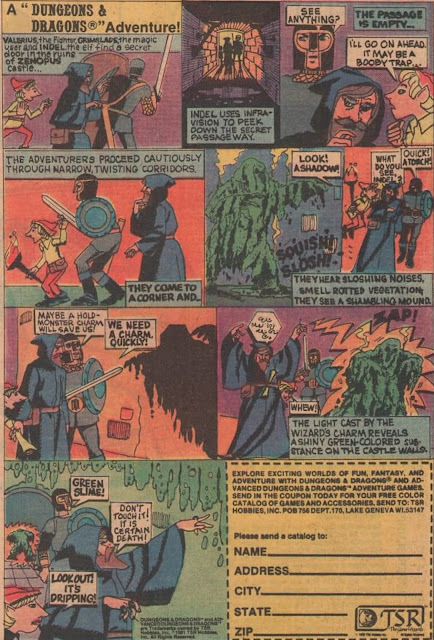 But the animated series has traveled some distance since that statement of principle, and some of that mileage includes Urko’s power grab. It is now entirely believable that the time has come for change, and peace, and that many apes would be open to the notion. So “Battle of the Titans,” and Return to the Planet of the Apes truly end on a note of strength. 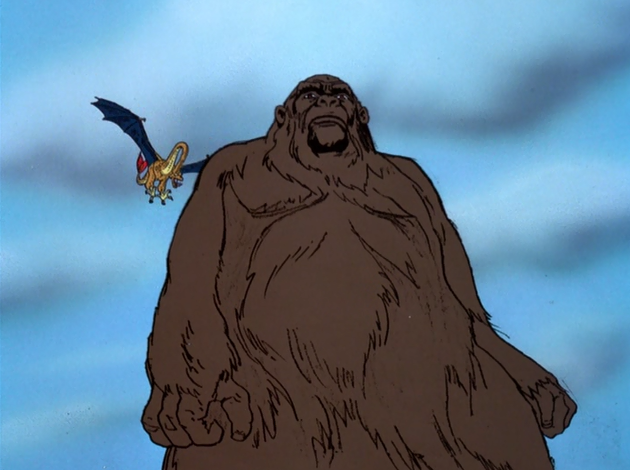 Again, this is a commendable and intelligent approach to children’s programming, though, finally, watching a giant ape -- Kygor -- and a giant bird duke it out hardly seems like the appropriate territory of a Planet of the Apes series. This kind of monster fight, in lieu of more solid science fiction concepts, is the kind of thing that keep the series from reaching a level of universal approbation, I feel. The fights are repetitious and not that interesting, and they eat up precious screen time that could have been utilized to further wrap-up dangling plot threads, or deepen characters. 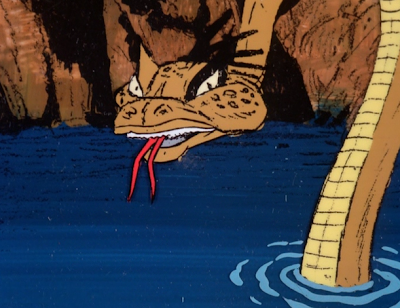 Still, it’s important to remember that this series aired in 1975, when concepts of story arcs and serialized television series were not fully formed, let alone for Saturday morning kid’s show. There are some franchise fans who prefer the cartoon series to the live-action series, and that’s because, I believe, Return to the Planet of the Apes actually shows momentum, movement and growth, whereas the live-action series -- as much as I enjoy it -- seems stalled forever on ideas of capture/escape, with very little new or original occurring episode to episode. John excellent review of “Battle of the Titans”. Return To The Planet Of The Apes 1975-1976 animated series is a far superior series to the prior year Planet Of The Apes 1974-1975 CBS live-action series for the very reasons you state that changes occurred. The live-action series on CBS never felt like they accomplished much. If it had been like this animated series it might have had a second season. That being said, Return To The Planet Of The Apes animated series should have had a second season.